No matter how ludicrous or hypocritical their accusation, anti-Israel propagandists can always expect a fair hearing and ample publicity from the Guardian – especially as it involves BDS. As such, within the past two days the Guardian has published two pieces on efforts by Palestinians and their anti-Israel chorus in the UK to pressure Fifa (the international governing body of football) to kick out Israeli football teams located in the West Bank – an article by Jerusalem correspondent Peter Beaumont and an op-ed by Palestine Solidarity Campaign director Ben Jamal. An earlier Guardian article by Beaumont on the row over settlement teams was published on Sept. 25th. All three Guardian pieces have one thing in common: they rely on the opinions of UN officials and anti-Israel NGOs, and give short shrift or ignore completely counter-arguments by Israeli officials and anti-BDS activists. At the centre of the controversy is Fifa’s own rulebook which says that football clubs which are Fifa member affiliates, such as the Israel Football Association (IFA), may not play on the territory of other football associations without the other association’s permission. Settlements are built on territory that is regarded under international law as illegally occupied by Israel, so critics argue that the settlement clubs are playing outside the IFA’s territory and without the permission of the Palestinian Football Association [PFA], which has been recognised by Fifa since 1998. HRW and others argue that Fifa is in effect legitimising the 49-year long Israeli occupation by permitting the games to take place. he HRW report goes further, suggesting that Fifa is in breach of its own new ethical guidelines, introduced as part of moves to clean up its image. “By allowing the IFA to hold matches inside settlements, Fifa is engaging in business activity that supports Israeli settlements, contrary to the human rights commitments it recently affirmed,” HRW says. “An April 2016 report, commissioned by Fifa and written by John Ruggie, the author of the United Nations Guiding Principles on Business and Human Rights(UNGP), outline the human rights responsibilities of businesses. Newly-elected Fifa president Gianni Infantino took office pledging to steer Fifa out of the human rights and corruption scandals of recent years, so that fans and players can focus on the ‘beautiful game’ of football. Doing business in the settlements is inconsistent with these commitments,” the group added. The speciousness of the reasoning used by activists to justify their campaign was revealed recently by Eugene Kontorovich, a law professor and expert on constitutional and international law. In his blog post at The Washington Post, Kontorovich demonstrated that the “legal arguments raised…are entirely contrived” and “contradict longstanding FIFA practice…”. He argued that, contrary claims by HRW and others, “there is simply no support in international law for prohibiting business in occupied territories, as British and French courts have recently affirmed”. Indeed, Morocco maintains a team, part of its national football federation, in occupied Western Sahara. Yet the HRW completely fails to mention this fact in its report. The human rights abuses in Western Sahara — where the majority of the population are Moroccan settlers and the indigenous population has been heavily displaced — are too vast to recount. No one — including the HRW and the Parliament members — has suggested expelling Morocco on account of its team, based deep in land taken from the Sahrawi. Kontorovich further noted that “nothing in the FIFA statutes that equates ‘territory’ with sovereign territory” and that “many FIFA members are not sovereign states at all”. …FIFA is not a border demarcation body. That is why FIFA clearly separates any question of sovereign statehood and territory from FIFA membership by not requiring that member federations be recognized states (i.e. Hong Kong, American Samoa, Faroe Islands, Northern Ireland, etc.). The claim that the acceptance of the Palestinian soccer federation into FIFA constituted a recognition of Palestine as a state and a recognition of its maximal border claims is unsupportable. FIFA membership does not imply statehood, nor has FIFA ever taken a position on preexisting border disputes. For example, British Gibraltar’s soccer federation is a member of the international soccer system despite being entirely located on what Spain claims as its sovereign territory. Indeed, Spain protested Gibraltar’s membership vigorously on these grounds. Similarly, the Taiwanese (Taipei) federation is recognized — but that hardly means FIFA has decided to reject China’s claim to the island. “FIFA’s recognition of teams”, Kontorovich added, “has never been understood as taking any position on the status of the territory where the team plays”. The Guardian attempts to demonstrate popular support for the pro-Palestinian position by citing a letter from 66 MEPs “which cited as a recent precedent the decision by European football’s governing body Uefa that Crimean football clubs could not play in the Russian league following Russia’s occupation of Crimea“. But, as Kontorovich explained, it’s actually remarkable that “only 66 MEPs signed the letter when anti-Israel resolutions routinely command vast majorities of the 751-member body”. Of course, in that situation [Crimea], Russia invaded its neighbor and assimilated its teams. In other words, the teams in question were ones that Russia had actually taken over. Here, no Palestinian team has been taken over by Israel — indeed, every single one of them has been created during Israel’s supposed occupation. Nor has Israel invaded and overrun the Palestinian Authority, which was established in 1994 — in short, there has been no change in the status quo. Beyond Kontorovich’s evisceration of the Palestinian’s argument to ban Israeli teams which play across the green line, there’s one relevant question that the Guardian will never ask: Should Palestinian teams be kicked out of Fifa due to incitement to violence – behavior seemingly inconsistent with Fifa guidelines – such as this? 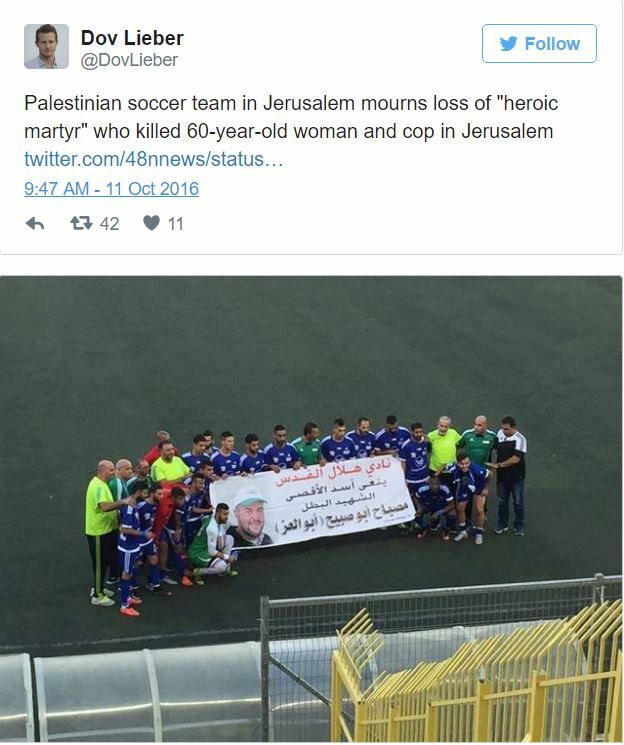 But, of course, a Guardian report on the ongoing problem of Palestinian sport and incitement to violence would egregiously contradict the news organization’s longstanding practice of insisting on a double standard for Israel. On Yom Kippur, we examine our sins, but defending Israel isn’t one of them. Can someone please tell me the name of this ‘international law’ to which they keep referring, the jurisdiction under which it was enacted and the date that it was enacted? It has become fashionable to quote as “international law” votes that have been taken at the UN. Of course the UN doesn’t determine international law in this way. The nations that are voting on these resolutions have no powers to determine what is legal or not. They simply vote according to either prejudice or their own specific interests. If the UN voted that 2 + 2 = 5 then such a vote would reflect the innumeracy of the majority – it would not amount to ‘international mathematics’. The UN doesn’t determine ‘international law’ in ANY way. Moreover, ‘international law’ is a complete fiction. For one thing, no jurisdiction exists anywhere to enact it. “At the beginning of the last century, football teams started to be formed in the suburbs of Tel Aviv and Jaffa, from where the game spread to other places in Eretz Israel – Palestine. These sides were fortified by recent immigrants from Europe, and in 1912 the first organised match took place between Maccabi Reihovot and a combined team of Maccabi Jaffa and Rishon Le Zion, who soon merged to become Maccabi Tel-Aviv. A new era dawned after the First World War when Palestine came under a British mandate and games were played between Jewish, Arab and British sides (army and police). New Jewish teams were founded mainly in Tel Aviv and Jerusalem, and in 1925 and 1926 relations were fostered with other nations, especially Austria as Hakoah Vienna became the first foreign side to visit the country. Meanwhile, Israel began to play home and away matches against teams from Austria, Lebanon and Egypt. This gave fresh impetus to football in Palestine. In mid-August 1928, a general meeting was held to lay the groundwork for a national football association and to request affiliation to FIFA. On 6 June 1929, the Eretz Israel – Palestine Football Association was accepted as a full FIFA member. However, a properly organised national league commenced only in 1932, with the participation of nine clubs. Cup games preceded the league championship. Football was the first sport to flourish in the wake of the War of Independence in 1948, and by October 1949 the leagues were again played to a normal schedule. A different demonstration of the fact the State of Israel was alive and kicking was the national team’s tour of the United States in September 1948, following the state’s creation. Official international footballing contacts started in 1934. Since then, Israel have participated regularly in the qualifying competitions for the FIFA World Cup, reaching the final round in Mexico in 1970. As for the Olympic Games, Israel were among the last 16 for the first time in 1968, also in Mexico, and then again at Montreal in 1976. Israel were an active member of the Asian Football Confederation (AFC) from 1956 onwards. In 1964 they won the AFC Asian Cup as hosts, and their youth teams lifted the AFC Youth Championship six times (1964, 1965, 1966, 1967, 1971 and 1972). However, Israel left the AFC in 1974 because of political issues. paleswinian savages celebrate a DEAD terrorist paleswinian, like they celebrated 9/11. Adam – “anti-Israel propagandists can always expect a fair hearing,… from the Guardian”? Or just a hearing? I’d think the latter.